Russian menu and manual in English/Russian! The Soeks Impulse Electromagnetic Field (EMF) Meter is designed for detecting and localizing dangerous EMF zones. During the measurement of electromagnetic fields in living spaces, residential areas and from PCs, threshold levels that trigger an audible alarm and the display of information are automatically set in compliance with standard regulations. The measurement is carried out along two orthogonal axes (X, Y) for electric fields and along three axes (X, Y, Z) for magnetic fields. The device features an alert sound and message display functionality to warn of high EM field intensity. To test this simply bring the device close to a wireless router, a laptop, or a mobile device while making a call. You will instantly be able to see the EM level of such hardware and gauge whether or not they pose a potential health hazard. An EM meter is a good way of protecting yourself and your family from the potential dangers posed by our modern hi-tech age. Such a device is invaluable to anyone living in or around areas such as: electric plants, high-tension lines, military facilities, airports, space observatories, manufacturing plants, scientific or other research institutions, big cities, or in the case of possessing a large number of technological devices that are constantly in use in your immediate proximity throughout your everyday life. EM fields are not visible to a human eye and cannot be detected with anything short of an EM detector, which in turn must be harmless for your health, for your children and for the elderly. 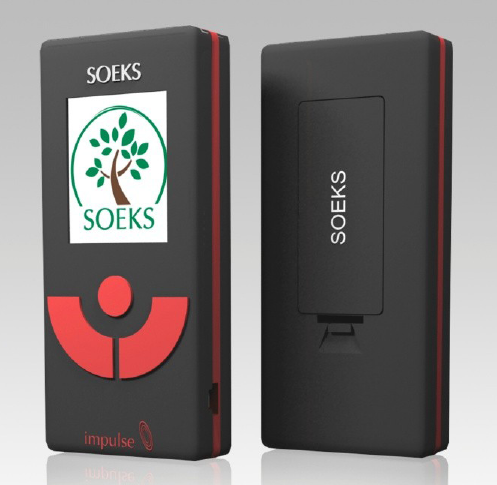 The Soeks Impulse carries the CE mark, certifying that it is in conformity with the essential requirements of applicable EC directives. 2. RMS value of electric field intensity along X and Y axes. 3. Electric field measurement units: kV/m (kilovolts per meter). 4. Electric field intensity threshold for audible, color and text warning triggering (it is set according to the active norms). 5. 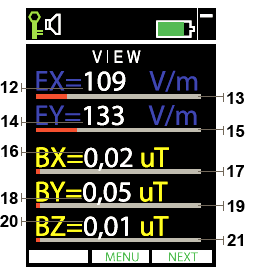 Graphic columns for display of instant electric field values along X and Y axes. 6. Information message about electric field level, according to the active norms. 7. RMS value of magnetic field intensity along X, Y and Z axes. 8. Magnetic field measurement units: uT (microtesla). 9. Magnetic field intensity threshold for audible, color and text warning triggering (it is set according to the active norms). 10. Graphic columns for display of instant magnetic field values along X, Y and Z axes. 11. 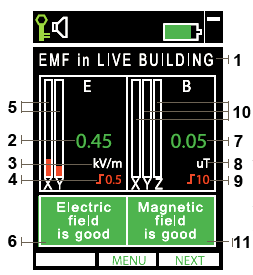 Information message about magnetic field level, according to the active norms. 12. Electric field intensity value along X axis. Measurement unit: V/m (volts per meter). 13. Graphic scale for output of electric field intensity value along X axis. 14. Electric field intensity value along Y axis. Measurement unit: V/m (volts per meter). 15. Graphic scale for output of electric field intensity value along Y axis. 16. Magnetic field intensity value along X axis. Measurement unit: uT (microtesla). 17. Graphic scale for output of magnetic field intensity value along X axis. 18. Magnetic field intensity value along Y axis. Measurement unit: uT (microtesla). 19. Graphic scale for output of magnetic field intensity value along Y axis. 20. Magnetic field intensity value along Z axis. Measurement unit: uT (microtesla). 21. Graphic scale for output of magnetic field intensity value along Z axis. Unfortunately the postal service became to prohibit send the batteries by plane. Therefore we lay out the AAA batteries from the parcel. Battery charger, power cord, rechargeable batteries and other accessories and supplies are purchased separately.